Hello, this is Gina Kim posting. As most of us in the U.S. are celebrating Thanksgiving Day with friends and family, I wanted to thank YOU for being a part of this community. For it is everyone's creativity that brought us here. 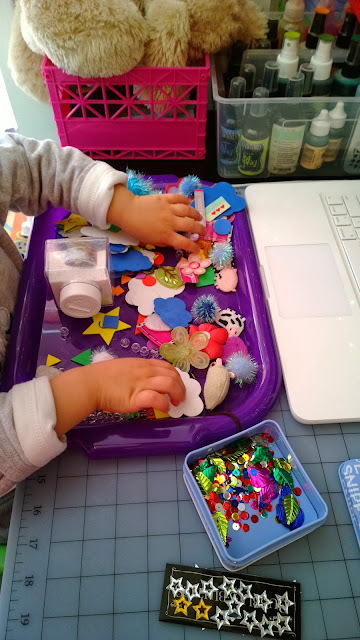 ...and crafty, little hands of a two-year-old want to share today? 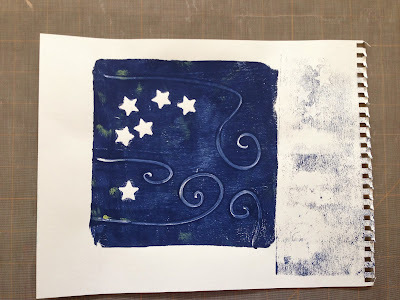 ...and join me over at my blog (www.ginaleekim.blogstpot.com) to find out how November's theme of "Moon and Stars" turned into this art journal page! Hi, Dion Dior here. 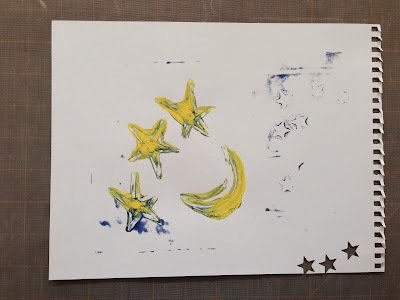 What a wonderful theme we have for this month, I love the idea of moon and stars and have had so much fun playing around in my sketchbook. 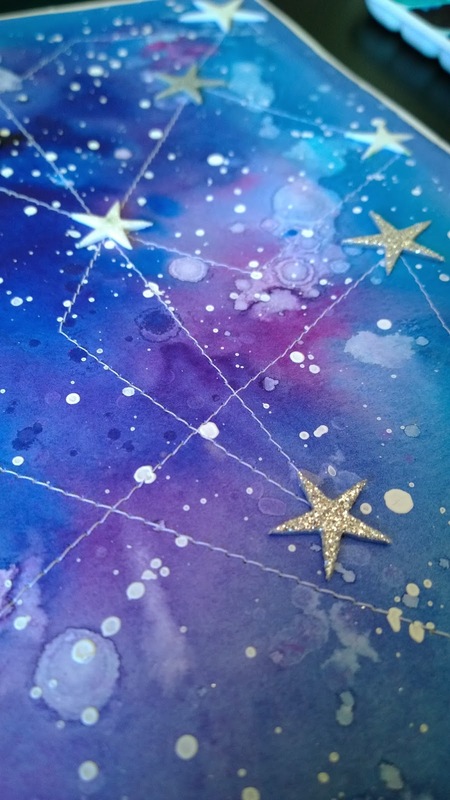 I couldn't help myself, I simply had to add glitter and sparkle to my "Moon & Stars" pages. 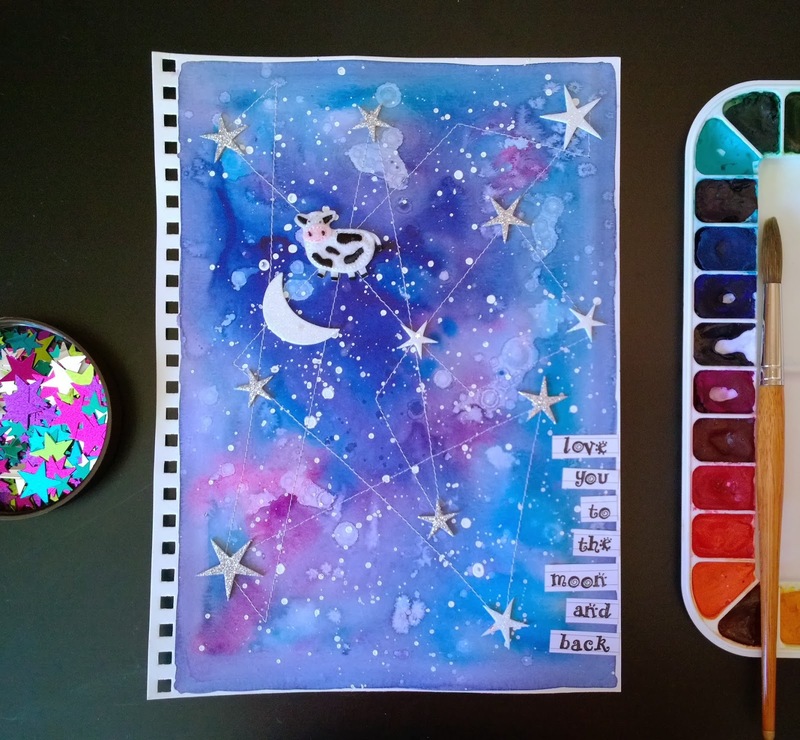 Thinking about the theme conjured up images of a glittering universe, so I created a sketchbook page that reflected my universe. Using a generous wash of metallic paint, I scraped it across my page with an old credit card. When it was still wet, I sprinkled glitter all over the page, then I used glitter glue to doodle stars and swirls. I left a large circle in the center of the page that I intend to use for a photo of my family. I used paint and glitter glue to write around this circle. 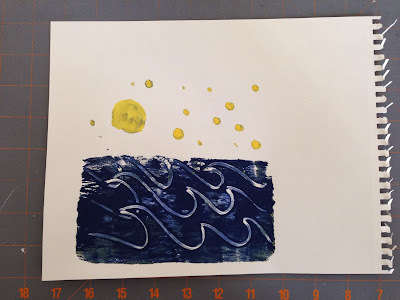 It is a complete break from my usual style, but that's the beauty of the Sketchbook Challenge, it gives us the opportunity to try out new styles and new ideas. When I hear words like moon & stars, quotes instantly come to mind. I have a huge collection of quotes. 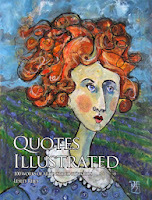 I have been using quotes to inspire my art for decades. In fact, I just published a book of art inspired by quotes - Quotes Illustrated: 100 works of art inspired by words, (available HERE and on Amazon. It's a compendium of art by over 80 mixed media artists. a crown of twelve stars. A sketchbook is a place to practice and experiment, so with that in mind, I decided to do my own lettering for the Revelations verse. I used a variety of white pens and a china marker to test out how well they would work on both the painted age and a TAP transfer. I wrote with the white china marker first, then painted over it because it acts as a resist to paint. It wasn't dark enough though, so I went back in with my Sharpie paint marker which did the trick. Then I used a black Pigma pen to outline the writing. The Pigma did not like the TAP transfer and stopped working 1/2 way through. I tried two more pens in my stash, a Sakura Identi Pen and a BIC Mark-It. Both worked beautifully. The biggest problem I encountered was that I need to PRACTICE my hand-lettering. I don't have the patience for it either. That's another thing I will have to work on. 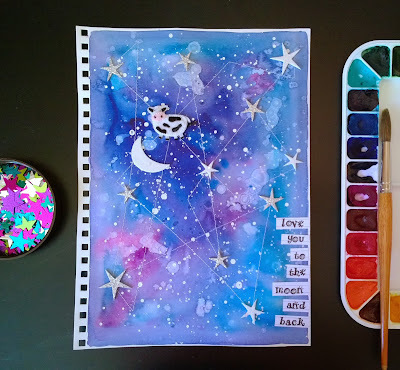 So for the next quote, I just transferred the quote (with TAP) and did a paint dribble page, collaged with stars and a moon cut from a Ranger metal foil tape sheet . has never learned to know her place. Jamie Fingal checking in on this month's theme. Drawn with a Pilot Razor Point pen on kraft paper. A whimsical village, with a cross hatch sky. I sat down and decided to challenge myself, by not using pencil first. It is a free-flowing sketch. 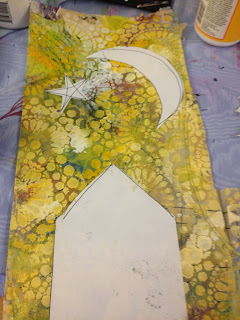 My second one is all about the crescent moon hanging over a group of beach houses. How will you challenge yourself with sketching this week? Hi! It's Deborah. 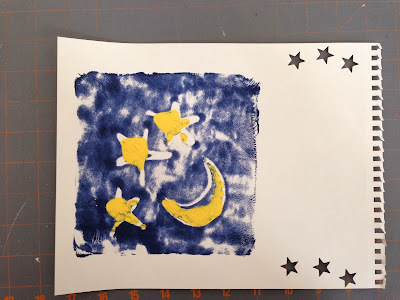 I decided to pull out some paint and my Gelli printing plate and play around with the Moon and Stars theme. It didn't take me long to make this mess! I just squirted, rolled, scribbled and pressed paper after paper after paper. 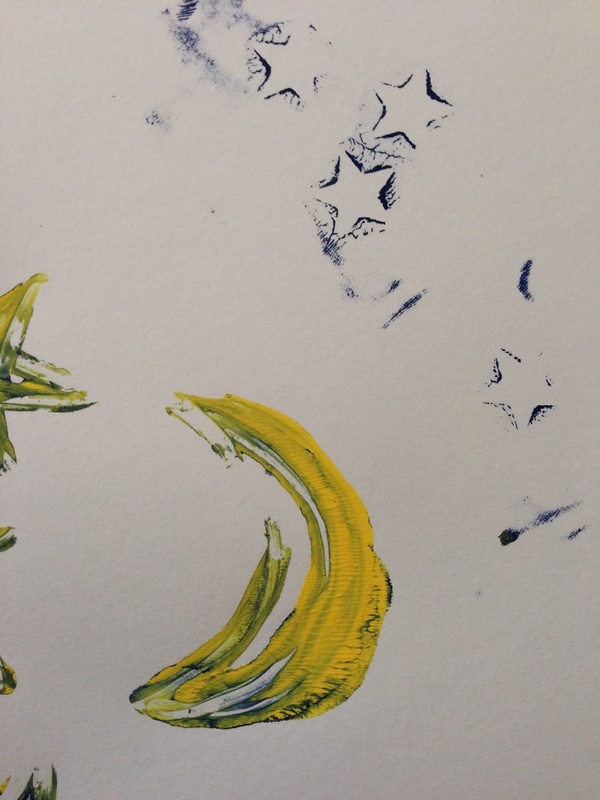 I put blue paint on just the bottom half and yellow dots for moon and stars for this one. 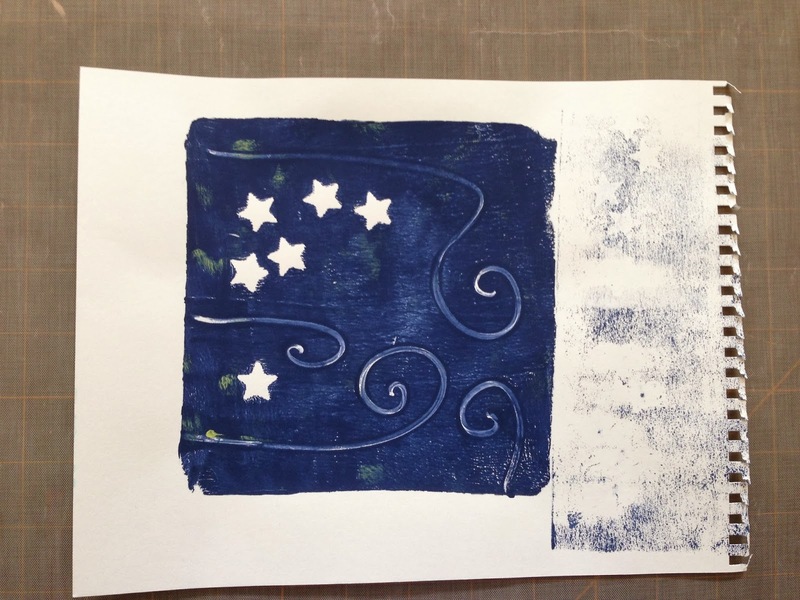 Here I layered the blue paint quite heavy and drew the moon and stars onto the plate before printing. 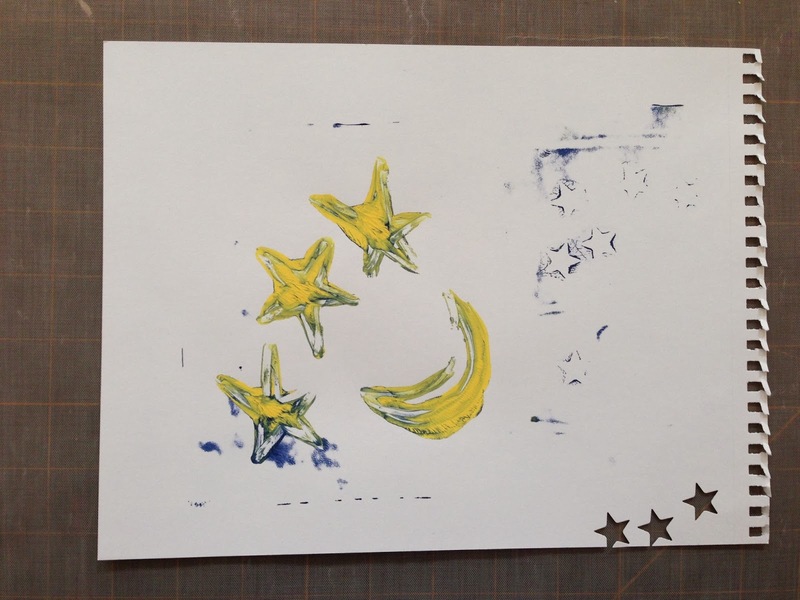 Then I added yellow paint to the stars and moons for this blobby print. 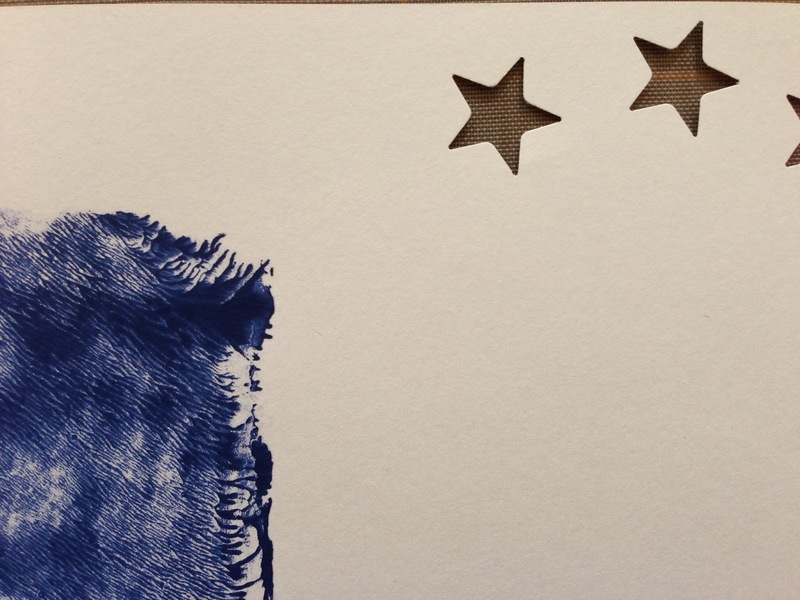 I also punched some stars that I used later as masks. 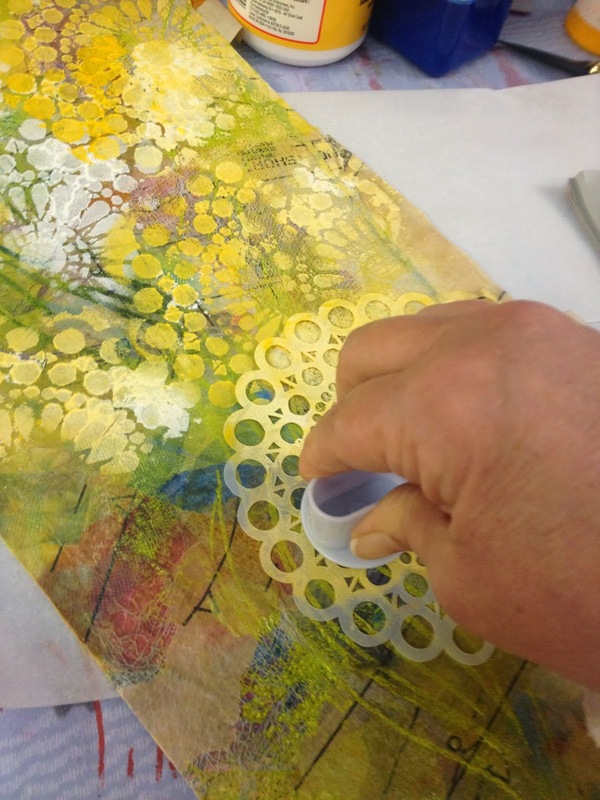 I think this super close-up is pretty cool... showing the lines of paint as the paper is pulled away from the gelli plate. Then I added a bit more blue and redirected the yellow so it fit the moon and star shapes a bit better. 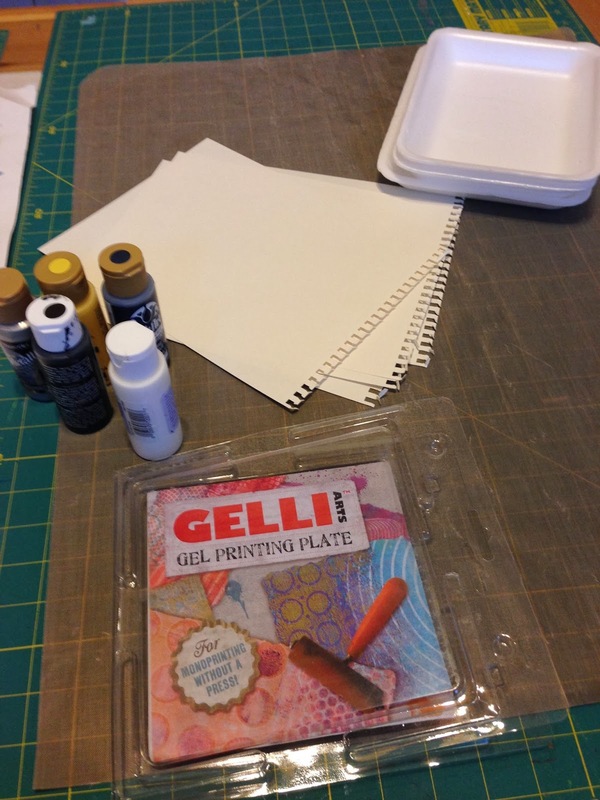 So many interesting subtle lines and textures can be created (usually unintentionally) with the gelli plate. Here are those masked stars. 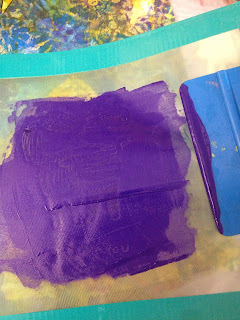 I have no idea what combination of prints, paint, ghost prints and reverse prints I might have used here. I'm not sure it's worth much on its own, but some of the details are interesting and it would be worth additional play with more imagery, doodling, stitching, collage or paint. Both blue and yellow paint on the plate, then I scribbled several stars and made this print which lifted off most of the yellow. Then I made a second print which got the remaining blue paint that was under the yellow after the first print. 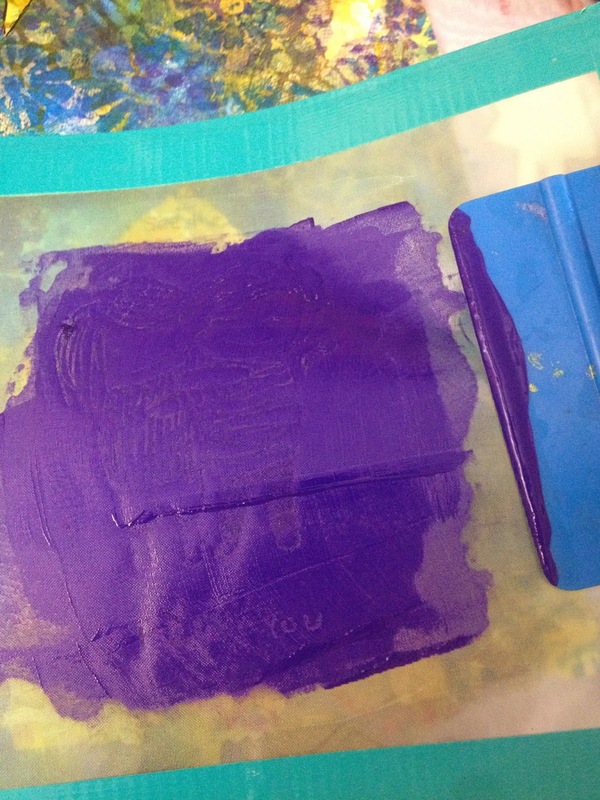 It's interesting to think about "planning" layers of paint on the plate and how they will create different results. For now these prints are just stacked up on the table in my studio. I'm not sure what I'll do with them. But, it really was fun to just play. That's what a blank sketch book and a theme can encourage! We have had a beautiful full moon over the past few days, which I see through the trees at my house. It is always a beautiful sight and barring clouds, the light is brilliant. The other night I awoke in the middle of the night and could see light coming from the hallway, outside my bedroom door. I got up, thinking I had left a light on in my office and found that the moon, having risen high above the trees was shining so brightly through the hallway window that it had apparently awakened me. I stood for a few minutes, marveling at the brilliance of that moon. A small gift in the night. We are leaving in a few days for Ecuador and I will view that beautiful moon from near the Equator, where, high in the Andes, it always seems even bigger and brighter. The Incas, who once lived in Ecuador built temples to the sun and the moon. 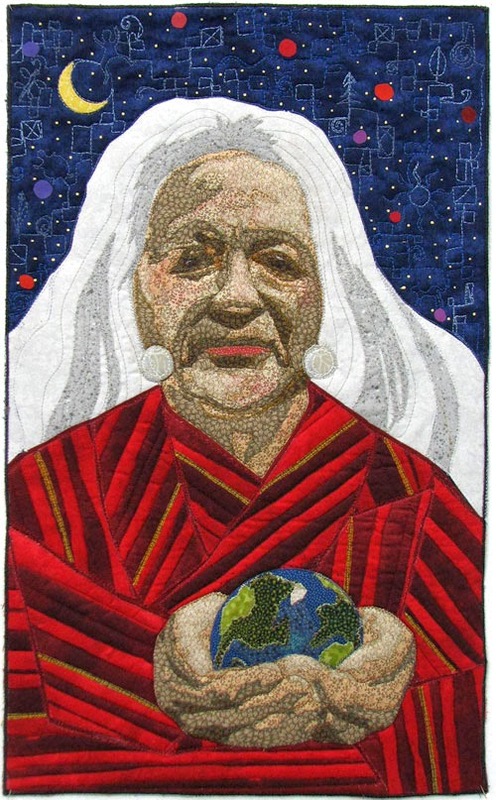 They revered the Pachamama, who is the mother earth who sits among the stars and the moon. It is still a custom in the Andes to salute the Pachamama when drinking among friends, by splashing a bit of one's beverage onto the ground and toasting "A la Pachamama!" This is my 12 x 20 piece for the Twelve by Twelve challenge theme "Mythology." My interpretation of the Pachamama, who sits among the moon and stars. I will be out of the loop while in Ecuador, so I will take this opportunity to wish all the artists and readers of the Sketchbook Challenge wonderful holidays! And during this busy time, take a moment now and then to look up and enjoy the beauty and inspiration of the night sky. Peace. Jackie here: I think this is quite a difficult challenge, although a lovely subject. Here is a suggestion. 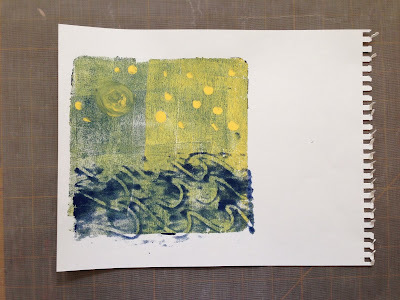 I looked in some of my books for images of the moon and stars; I particularly remembered many images of the moon and sun in medieval embroideries. Some of the images are quite small so I used a magnifying app on the ipad to enlarge them and saved to the camera roll. By the way this app is also useful if you have got to the stage of not being able to read labels when you are cooking! I have just found another app which replicates an old drawing tool called a Lucida Camera. You see the image on your ipad or iPhone and trace it onto paper. Hard to explain but there are some good videos which show the process. I don't think tracing is great, but it does give a starting point and also makes one look at an image and find out more about it,of course this can only be a starting point for your own ideas. Whatever, it is fun. Leslie here. I love to look at the night sky in the fall. The temperatures here in South Texas are beginning to cool off and the night sky is usually a bit clearer. One of the biggest treats is to go outside and view the moon when Venus is nearby. 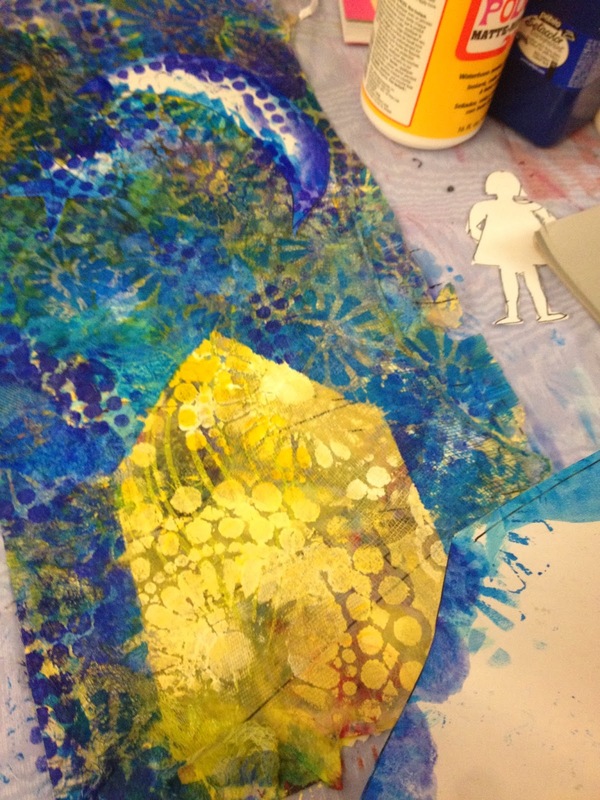 For this project I began by creating a collage using ephemera such as old pattern paper, gauze, and other bits of sheer cloth. Using the "Stitch A Doily" stencil from StencilGirl, I worked across the surface with opaque white and yellow acrylic paint, overlapping as I went. the surface with a warm dry iron. 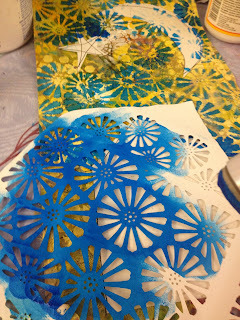 Then, using a laser-cut envelope as a stencil I worked across the surface with transparent blue and a blue-purple paint. Once the freezer paper is removed I have my shapes. Inside the house, I wrote the first portion of the lullaby, "I See The Moon". 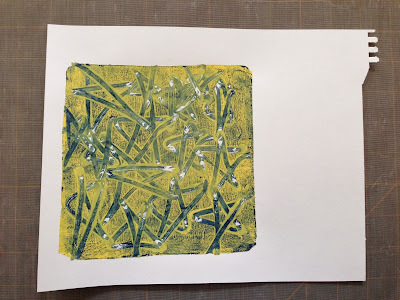 I used a Pentel Gel Roller Fabric Pen. This pen is great, even over such a rough surface! shine on the one I love. sing to the one I love. for her birthday a few years ago. Jane LaFazio here. 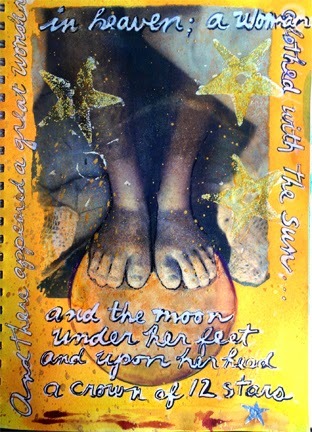 Here's a page from my sketchbook using collage as the background and the gold moon and yellow stars as the theme. 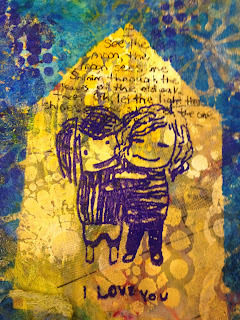 I've got a step-by-step tutorial on how I created this page on my JaneVille blog. Hi there, this is Jacqueline. 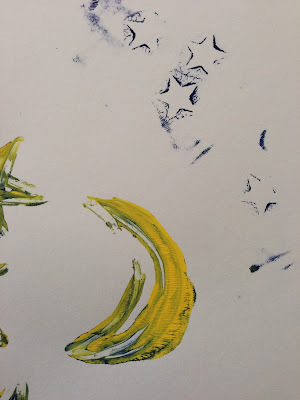 This month’s theme is about those captivating celestial bodies - the moon and the stars. They remind me of a much-loved poet, Emily Dickinson and her lovely poem, The Moon was but a Chin of Gold. 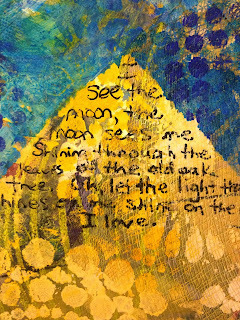 I often include snippets of her poetry on my watercolor journal pages. I love how she puts her words together to form sparkling strands of lyrics. 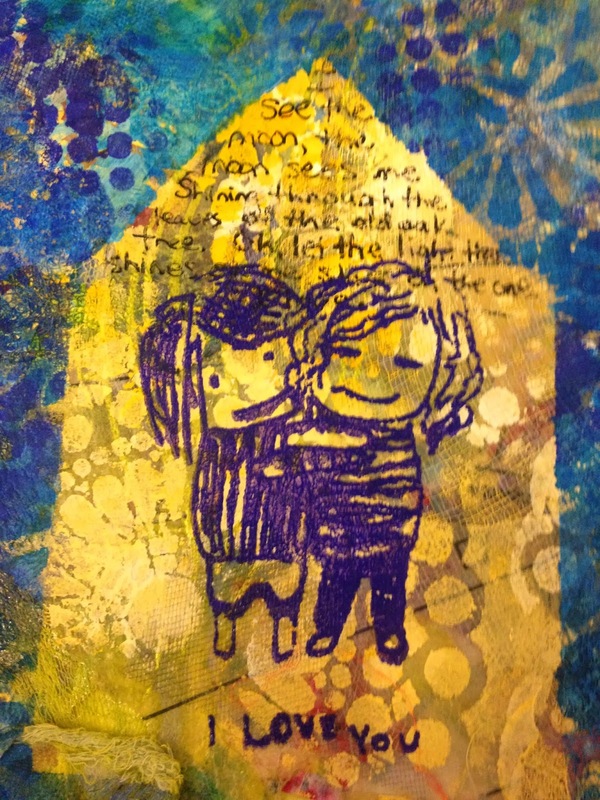 Here is a peek in one of my journals where I used parts of this poem. If you would like to read her poem in its entirety, I posted it below. Do you have a poet or poem that inspires your art? Were such her silver will!